P.D. 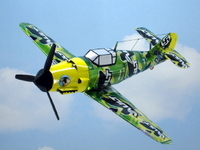 Wayne Mathis builds model airplanes out of old soda and beer cans. I spoke to him recently about his amazing ability to reuse, re-purpose, and recycle cans in this fashion. 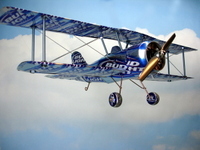 ephemera: When did you become interested in turning beer cans into planes? Mathis: I've been making model airplanes since the age of five, and have made them out of virtually everything you can imagine. So, I've been just plane nuts for most of my life. Sometime back in the mid-80s, after examining some of my wooden models, a fellow pilot friend challenged me to make an airplane out of beer cans. Two weeks later, I sold that first beer can airplane for $35.00, and I was hooked on making airplanes out of beer and pop cans. By the end of two years, I'd made and sold more than 400 beer can airplanes. ephemera: I'm really amazed at the detail and craftsmanship of these planes. The models look stunning. What challenges did you encounter in the design and production? Mathis: Since there was no-one else, that I knew of, making airplanes from can I had to devise ways of doing everything myself. Such as; Develop an easy way to cut the cans. Come up with a method of fastening the cans together into the desired shapes needed. Designing planes that were compatible to the shape of beer and pop cans, etc. ephemera: They are feats of engineering and creativity. What are your favorite planes? Mathis: The Prop planes are my favorite with the Messerschmitt BF-109 and the P-38 Lightning being my all-time favorites. Although when it comes to airplanes I love them all and with each new design I come up with I get ideas for the next plane I'll design. ephemera: What's your advice for achieving success? Mathis: Find your music and play the hell out of it! Airplanes are my music. I love the engineering that went into them. I love the freedom they afford you. I love their lines, design, and the shape of them. I love the sounds they make, both when they're alive with their engines roaring and when they're at rest on the tarmac. In my eyes, there are no ugly airplanes, they're all works of art. ephemera: What resources and tools do you recommend for people interested in making their own beer can planes? Mathis: I am the definitive source for anyone interested in making airplanes out of beer and pop cans. I currently have 14 different models--that I've designed--ranging from Ultralights to Jets. All of my planes can be made from tools already found in most households. The construction manuals offered on my Web site are comprehensive and take the builder step-by-step through the building process of each plane. For those who would like added instruction, I also have two videos/DVDs available that show from start-to-finish how the planes are made. Your 7-up DeHavilland Beaver is the coolest thing I've seen in a while. Do you sell them and if so how much. I would love to have one. 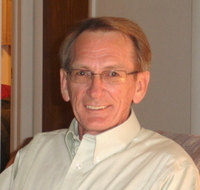 Wayne: Wow this info goes back a ways from the blue print plans in the mid Eighties to today. Good to see someone is "show caseing" you models. Cliff: I have making Wayne's planes from when he started making them on blue prints if you still looking let me know.